Women were granted the right to vote nationwide 96 years ago. These days, they vote in greater numbers than men. The 19th Amendment, which granted women the right to vote, was ratified 96 years ago on this day in August. 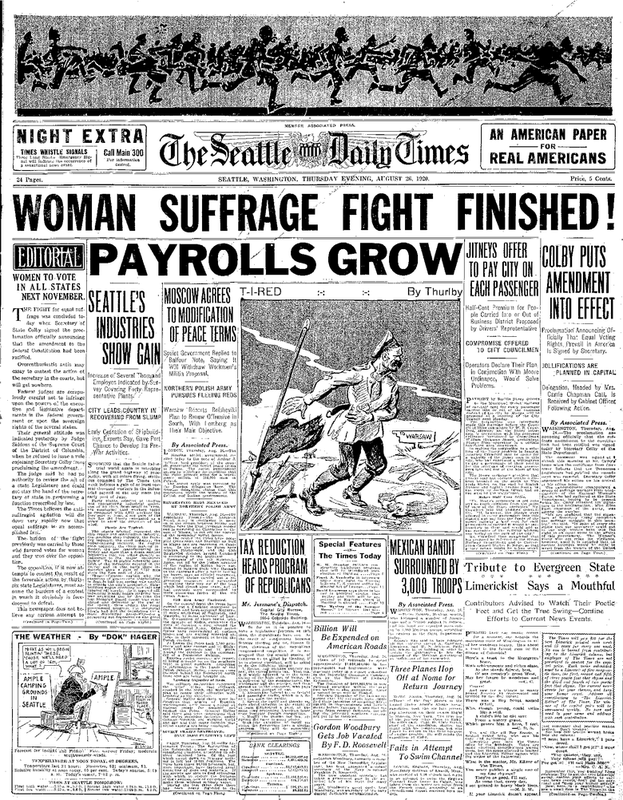 “WOMAN SUFFRAGE FIGHT FINISHED!” read the banner headline on the front page of the Aug. 26, 1920, Seattle Daily Times (which at the time carried the slogan “An American Paper for Real Americans”). “Jollifications are planned in capital,” The Times noted. The paper also ran a front-page editorial — rare placement for an opinion piece — chiding the suffrage movement’s naysayers. “The Times believes the anti-suffragist agitation will die down very rapidly now that equal suffrage is an accomplished fact,” the editorial read. Women were already voters in Washington state, which in 1910 became the fifth state to grant women the right. Women in our state and across the country have exercised their right to vote with distinction — at least, compared to men. In every presidential election since 1980, the proportion of eligible women who vote has been higher than that of male voters, according to the Center for Women and Politics. The participation trend held true in the most recent national election, in 2014. Of all American women eligible to vote that year, 66.3 percent were registered to vote, and 43 percent cast ballots, according to Census Bureau figures. Those nationwide rates were lower among men: just 62.8 percent registered and 40.8 percent voted. In 2014, Washington ranked eighth nationwide by percentage of women choosing to vote. Of women eligible to vote in this state that year, 51.7 percent voted, while just 48.3 percent of men sent ballots in.